Swimways has had shelf space in the toy section for several years now, particularly in Target and ToysRUs. 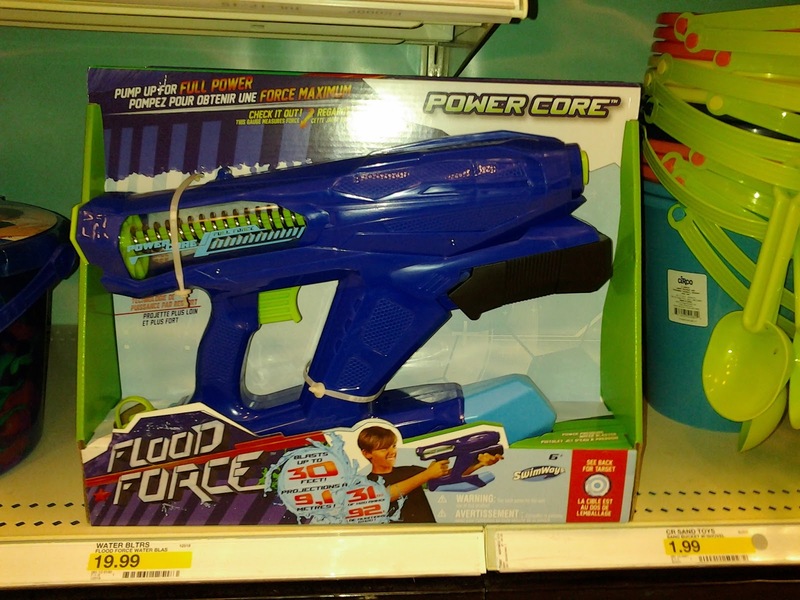 Their blaster debut at Target had a rough start, however; not only had Target chosen them over Buzz Bee Toys' Water Warriors for the water blaster section, but they had also proceeded to use blaster shells virtually identical to BBT's past products. Fast forward two years, and Swimways has made some progress in product design. By far the most interesting is a brand new blaster at Target called the Power Core. For $20, it offers a large spring-powered firing chamber and claims up to 30' ranges. Sadly, the blaster is flawed, and not nearly as exciting as it might appear to be. Spotted a while ago on Kmart's website by a few Redditors, the TMNT T-Blasts are a new series of blasters from Playmates Toys. A week ago, I actually stumbled upon all the blasters in ToysRUs, which doesn't have them listed yet. I went ahead and grabbed three of the four blasters (I left the crossbow blaster on the shelf). I didn't know what to expect, seeing as these were sitting in the character toys section and not with the blasters. As indicated by the "4+" on the box, it's geared toward younger kids who watch the reincarnation of TMNT on Nickelodeon. However, it turns out these blasters have some interesting qualities and at least some modding potential.